In partnership with UCanGo2, the Oklahoma College Assistance Program publishes a monthly newsletter called Your Bottom Line, featuring news and resources for students, consumers, campus professionals, counselors and community partners. Check out the latest edition for timely information about personal finance, college planning and student loan management. To stay up-to-date, sign up to receive Your Bottom Line every month. As spring draws near, why not use UCanGo2's free college planning resources to educate your students about finding scholarships, completing the FAFSA, visiting a college campus or doing some career exploration before the end of the school year? Visit UCanGo2.org to place your order today! 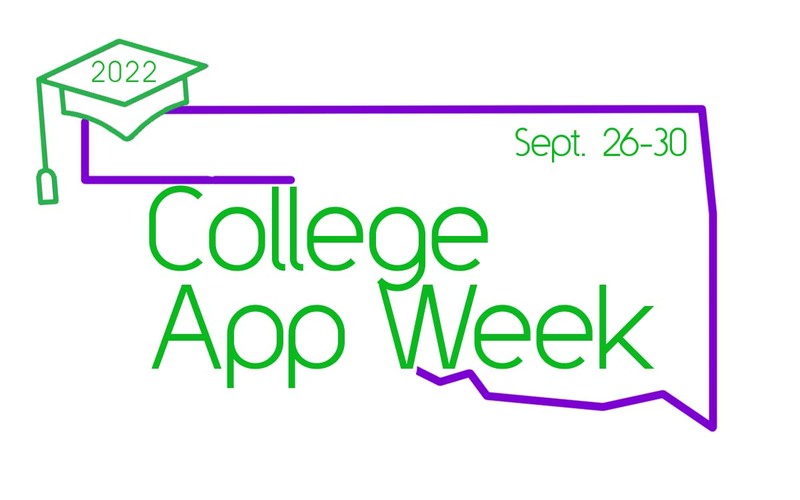 Thank you for another great College App Week! College Application Week (CAW) is an annual, nationwide event that provides an opportunity for high school seniors, especially those who have never considered college or will be the first in their families to attend college, to receive hands-on assistance from knowledgeable volunteers while completing their college applications. CAW 2018 was a great success! More than 70 high schools and colleges registered, over 4,000 students participated and almost 5,400 college applications were completed—and those applications went to 140 colleges in 34 states! This year, Oklahoma’s CAW is scheduled for September 23-27. If those dates don’t fit into your busy fall schedule, no problem! Feel free to schedule your event for any week from September through November. Are you concerned about having the time or resources to plan an entire week of college access activities? Once again, no problem! As long as you have at least one day during your CAW to give every high school senior a chance to submit one or more online college applications, you’ll be an active participant in this exciting statewide effort. Whether you’re planning a grand, five-day College App Week or one College App Day, we have all the free resources you need to plan and host your event. Perhaps you’ve held regular activities in the past that meet the objective of College App Week. If you promote any college application activities this fall, we’d love for you to register your event with us so we can combine your efforts with others in our great state to let Oklahoma shine! The American College Application Campaign (ACAC) has challenged us to reach an enrollment of 100 or more schools and organizations for CAW 2019. We’re SURE we’ve had that many—and even more—participate in the past, but if you haven’t registered your event with us, we have no way of knowing what you’ve been up to! Visit OKCollegeAppWeek.org to register your school or organization for CAW 2019 and to see the resources that are available to help you plan a successful CAW. Simply click the Register Now button on the CAW home page to enroll. Your registration will ensure that you receive your free supplies, including promotional posters and an “I APPLIED” sticker for each participating senior. Start planning now for CAW 2019. We’re looking forward to another great campaign! For more information, contact Letha Huddleston at lhuddleston@ocap.org or 405.234.4345. With the fall semester in full-swing and the Oct. 1 release of the Free Application for Federal Student Aid (FAFSA), the outreach team at the Oklahoma College Assistance Program (OCAP) has been in schools and the community in full force. Its two largest objectives in the fall are promoting college preparedness and completion of the FAFSA. OCAP’s outreach team has already mailed over 1,000 college prep and FAFSA kits to counselors and presented over 80 college preparedness and FAFSA presentations around the state so far this fall. The fall semester has always been the busiest time for UCanGo2, OCAP’s college access initiative. Through UCanGo2, OCAP’s outreach team helps counselors, teachers and administrators create a college-going culture in schools by offering on-site presentations and providing a full range of college planning resources. This includes information about academic requirements and finding the right institutional fit, career exploration tools, financial aid educational materials, scholarship guidance and much more. The new 2019-20 FAFSA became available Oct. 1, but OCAP’s FAFSA awareness campaign began in August. Families are encouraged to complete the application as early as possible, while federal and state funding is available. FAFSA results are also sometimes required for state and other scholarship applications, so timely completion serves multiple purposes. “Our presentations are designed to show students and families that the FAFSA can be completed easily,” said Kelnar, “and everyone planning to attend college or a career technology center should apply. Most people who complete the FAFSA are offered some kind of aid.” These grassroots efforts are also supported by a targeted digital media campaign designed to raise FAFSA awareness among Oklahoma students and families. This year, the outreach team’s FAFSA promotional efforts also include the National College Access Network (NCAN) FAFSA Completion Challenge, for which OCAP received a $40,000 grant to provide FAFSA completion programs and services to Oklahoma City Public Schools. NCAN’s project focuses on areas with current FAFSA completion rates below the national average and challenges grant recipients to increase their city’s FAFSA completion rates by at least 5 percent. UCanGo2 is a comprehensive college access outreach initiative of the Oklahoma College Assistance Program, an operating division of the Oklahoma State Regents for Higher Education. For additional information, like UCanGo2 on Facebook and join OCAP’s mailing lists at ocap.org/News/subscribe.shtml to receive the most important college planning and FAFSA updates. To learn more about the FAFSA, visit StartWithFAFSA.org. The Oklahoma College Assistance Program (OCAP) provided four Oklahoma Counselor Connect workshops this fall, highlighting college planning services offered through the State Regents. These workshops, offered in Oklahoma City, Ardmore and Tulsa, are a new service provided by OCAP’s outreach team, taking the place of the recently discontinued National Training for Counselors and Mentors (NT4CM) workshop program. At each workshop, OCAP’s outreach team presented new information and highlights of the 2019-20 FAFSA and the helpful resources provided through StartWithFAFSA.org, the UCanGo2.org college planning website, instructional materials provided in the FSA Financial Aid Toolkit, and updates on the new features of OKcollegestart.org, including college admission applications at the click of a button and Individual Career Academic Plan (ICAP) instruction and templates for Oklahoma schools. The guidelines for Oklahoma’s Promise were covered in detail and the Oklahoma Money Matters team offered a presentation about the financial education resources they provide to schools and families across the state. Information about the new Oklahoma FAFSA Data Portal (OK-FDP) was also presented, including how counselors can enroll and begin tracking their 2019 seniors’ FAFSA progress. Oklahoma Counselor Connect workshops will continue to contribute to OCAP’s ongoing mission to provide schools and community partners the support required to empower students and families to reach their educational goals. “We knew when NT4CM was discontinued that we needed to continue providing training that supports efforts to educate students and parents as they prepare for higher education,” said Kelli Kelnar, OCAP outreach manager. “That’s why we developed Oklahoma Counselor Connect. We originally scheduled three workshops this year, but demand was so high that we added a fourth to accommodate more counselors and mentors.” Through these workshops, OCAP offers informational sessions for Oklahoma’s high school and middle school counselors, financial aid administrators, Native American program specialists and various community partners. OCAP, an operating division of the State Regents, provides college access, aid awareness, financial literacy and student loan management programs and services that benefit students, parents, schools and community partners. OCAP offers numerous FAFSA resources for educators and students through StartWithFAFSA.org, UCanGo2.org and OKcollegestart.org. To learn more about OCAP, visit OCAP.org. The 2019–20 FAFSA is here! Here are a few tips you can share with your students. This year students can access the FAFSA by visiting FAFSA.gov or by using the NEW myStudentAid mobile app. The FAFSA should be completed as soon as possible after Oct. 1 to ensure priority consideration for some types of financial aid. It’s best to gather all necessary materials before starting the FAFSA. Since the 2019–20 FAFSA allows applicants to use 2017 tax information, families can use their 2017 return to complete the application right away! There's no need to wait. To complete and submit the FAFSA online, students and one of their parents/guardians will each need to create an FSA ID (Federal Student Aid ID) at FSAID.ed.gov . This username/password serves as an electronic signature on the FAFSA and certain student loan applications, and allows them to access other federal student aid websites. It’s beneficial for families to create their FSA IDs before starting the FAFSA to speed up the application process. Visit UCanGo2.org to download an FSA ID Worksheet (in English and Spanish) to keep track of your information. For more information and FAFSA resources, including educational tools and tutorial videos in English and Spanish, visit StartWithFAFSA.org. The Oklahoma FAFSA Data Portal is Available! The Oklahoma State Regents for Higher Education (OSRHE) and the Oklahoma College Assistance Program (OCAP) are now offering the Oklahoma FAFSA Data Portal (OK-FDP), a free online tool to help counselors, principals and mentors better assist their high school seniors successfully complete the Free Application for Federal Student Aid (FAFSA). By giving authorized individuals from Oklahoma school districts access to student-level information on FAFSA completion status, the OK-FDP will allow educators to provide more targeted assistance to their students. This is instrumental in increasing FAFSA completion rates – especially among first-generation students pursuing postsecondary education. Learn more and get started here!